Everyone seems to have a year-end list, and I honestly didn't think I would have a list to blog about. 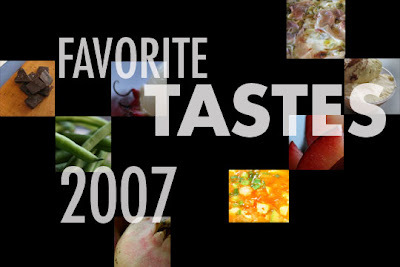 But when I thought about it, I realized that this year I discovered a lot of interesting tastes and flavors. I mean, that's the thing I love about food--there's always something new you haven't tried. No. 10: Olive Oil and Rosemary Bread from LaBrea Bakery. This is actually a recent food discovery for me. I love LaBrea's bread and I get it regularly from Whole Foods, which gets it half-baked from Southern California and then finishes up the baking at the store. This means the bread is fresh and warm when you buy it. 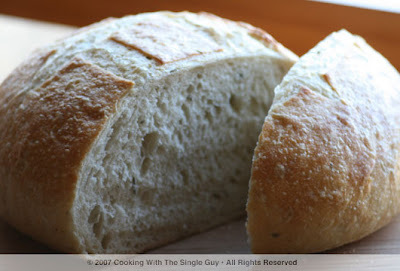 I typically buy the Whole Wheat bread but recently picked up this Olive Oil and Rosemary Bread. It's sooo amazing in terms of the softness inside but with this strong rosemary essence. So wonderful. No. 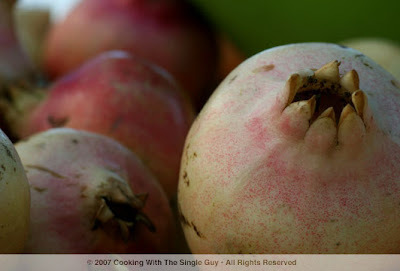 9: White Pomegranates. While this isn't a new taste, it definitely is a new look. I've never seen pomegranates in this pale color. While I still love traditionally rich, ruby-colored pomegranates, this white version has this ethereal feel that adds more mystique to this romantic fruit. No. 8: Speck. 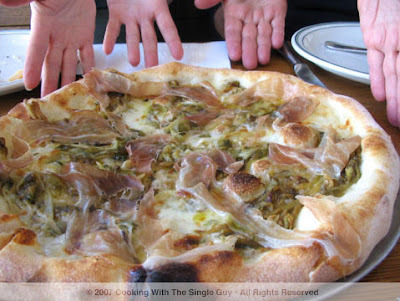 I first saw speck, an Italian cured meat, strewn on my delicious pizza at Pizzeria Delfina in San Francisco. I'm a big fan of prosciutto, but speck has a leaner feel with less of the fattiness of prosciutto. So with just that one fact, it makes speck my new favorite Italian cured meat. 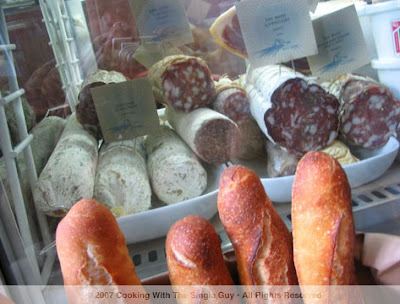 I find speck at the deli section of The Pasta Shop at Markethall in my Rockridge neighborhood. No. 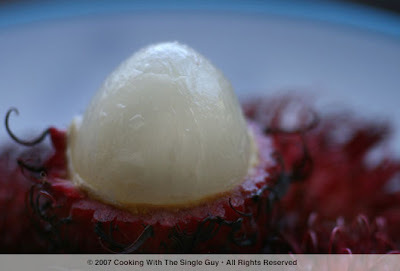 6: Rambutan. I saw this tropical fruit during my trip to Vietnam in January. It looks so exotic, but has memories of my favorite childhood Chinese fruit known as lychee. I was even more excited to see Rambutan sold in the San Francisco Bay Area. It's nice to know I can get this every year when they're in season. My new favorite furry fruit! No. 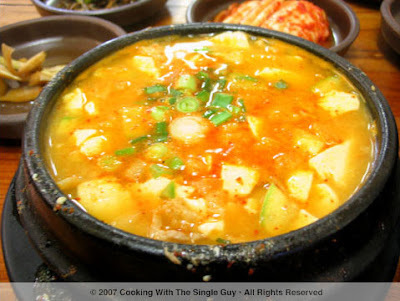 5: Soft Tofu Soup. My sister loves this but I never tried it until this year when I visited Pyung Chang Soft Tofu House in Oakland. It's this amazing Korean dish made of soft silky tofu in this spicy soup. So comforting and amazing. One of my favorite things to get for a quick dinner. No. 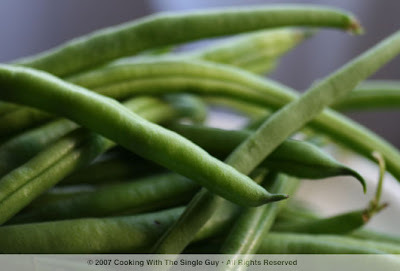 4: Blue Lake Green Beans. I didn't think green beans could be different from one another. They all look the same. But when I bit into my first Blue Lake Beans this year, I fell in love with the watery crispness. I now eat exclusively Blue Lake Beans. Forget about all the rest! No. 3: Poco Dolce Chocolates. 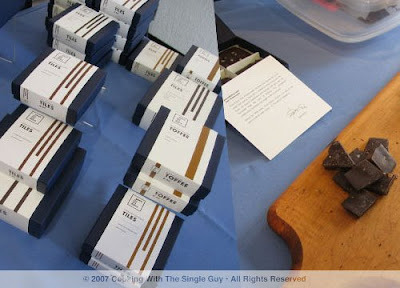 I've raved about this chocolate from San Francisco ever since I tried it at the Chocolate Salon at Fort Mason. Poco Dolce's chocolates are pretty expensive so I can't always buy and eat it, which is probably a good thing because I'd probably gain a lot of weight just eating this again and again. 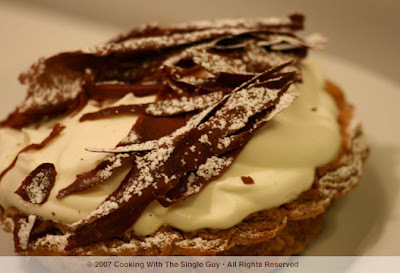 But I do love the bittersweet chocolate flavors with the fleur de sel sprinkles on top. Mmmmm. No. 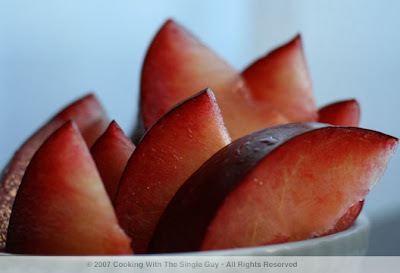 2: Flavor King Pluot. This was one of my surprising finds of the year. I didn't think a plum would be sooo sweet and distinctly flavored. The meat is also very beautiful to photograph because of the rose-peach color, depending on the ripeness. From now on, every summer I will be on the lookout for the Flavor King! No. 1: Bomboloni. I'm sure it's no surprise that my No. 1 favorite new taste this year is the Bomboloni doughnut from Boriana's Corner at the San Francisco Ferry Building. 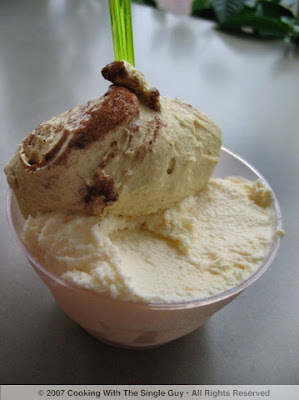 And I'm sure I'm not the only one recommending this Italian treat, because every time I've gone to buy one from this small shop, I overhear someone raving about how they heard it from someone, etc. 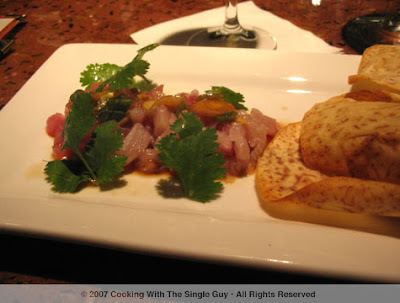 (Maybe they heard it from the Single Guy Chef!) However, there has been some grumblings lately on Chowhound about how some people have had some stale experiences. 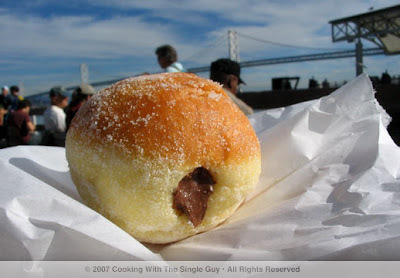 I'm hoping that this isn't true, because I love my custard Bomboloni (and even the Nutella bomboloni pictured above). The Bomboloni has given me so many happy memories for 2007! 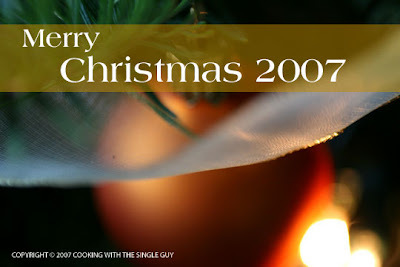 Hope you all have a fantastic New Year and looking forward to discovering new tastes and flavors in 2008! Growing up in Honolulu, New Year was an extremely festive and busy time for all my Japanese-American friends. The Japanese celebrate New Year on Jan. 1 unlike most Asian cultures, which follow the lunar calendar. Since Japanese-Americans made up close to a third of the population in Hawaii, the New Year always brought TV news stories about the gold-like prices for tuna (raw fish is popularly served, as you might guess, at new year's parties) and the ritual pounding of mochi on New Year's Day. 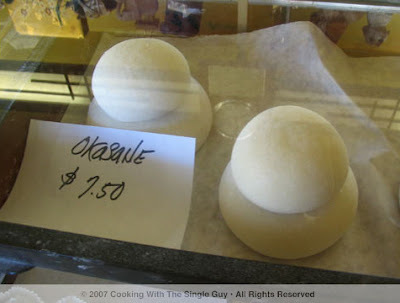 Mochi, or komochi, is made of rice flour (sold under the brand Mochiko). It's sticky and soft after steamed into cake patties. Something similar is found in other Asian cultures. In the Chinese culture, a similar sticky rice cake is made for the new year, called lien gou. 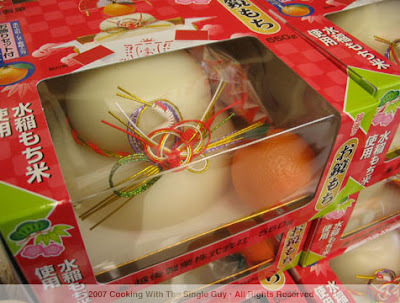 If you want something ornamental and not necessarily freshly made, you can buy one of these imported Japanese new year mochi cakes at Nijiya Market at Post and Webster. It even comes with a plastic orange to symbolize the coming of spring, or plastic spring. 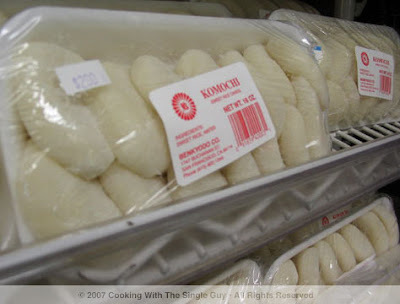 Over at the tiny Uoki Sakai Fish Market on Post Street, I found more user-friendly komochi made fresh by Benkyodo. So these tiny rice cakes or komochi are eaten in the new year in a soup known as Ozoni. Sticky rice cakes are popular in Asian cultures for the new year because it symbolizes how the family sticks together just like the sticky rice, and it's sweet so you know you'll have a sweet year ahead! My friends Stella and Mariusz were visiting this week from Virginia Beach, so since I had the week off, we drove up to Napa the day after Christmas. 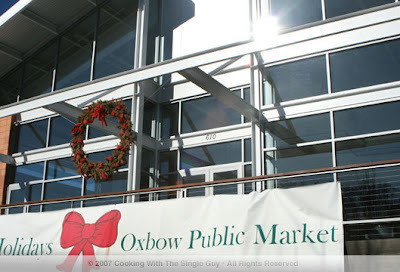 One of the places I told them we had to check out was the new Oxbow Public Market. The Oxbow Public Market in downtown Napa opened just a couple of weeks ago. But it's doing a "rolling" opening, which means that you can visit the marketplace but not every store is open. So each storefront will open in the next few weeks, as they're ready to be open. If you wait a couple of months, you'll probably see the Oxbow at its complete glory. But if you visit earlier, you also get the chance to chat with the store owners as they prepare to open their places. Either way, it's definitely a fun place to food explore. One of the first stop as you walk into the Oxbow's warehouse-like location is the Folio Enoteca & Winery. Enoteca is Italian for wine cellar. They have a little cafe like area and they're actually producing wine on site. 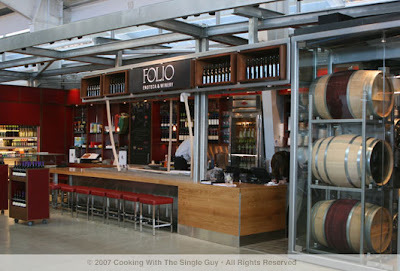 Folio is an offshoot of the Mondavi family, owned by Michael Mondavi. Of course, there has to be a chocolate purveyor. At the Oxbow is Anette's Chocolates of Napa Valley. 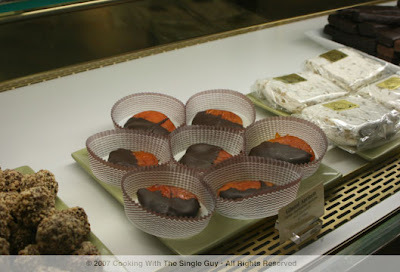 Here's a photo of chocolate-dipped apricots. Yum. 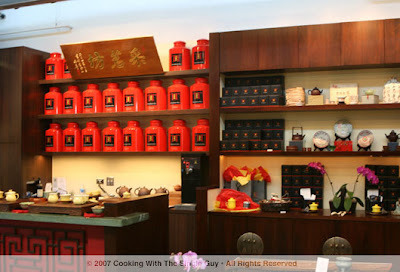 One of the more impressively organized and displayed storefront is this by Tillerman Tea. It's a new tea company based in Napa created by two partners (one of whom came from the winery industry) who followed their passion for tea. Stella loved the bright red tea cannisters. 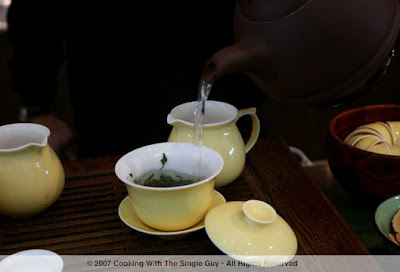 We did a tea tasting at Tillerman, and the owner, David Campbell, served us a green tea from China called mon jian. It was very nice with a very slight smokey flavor that reminded me of Dragon Well tea. 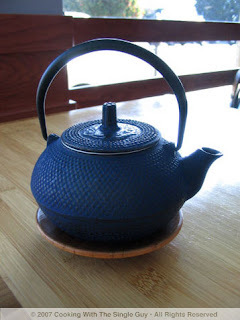 I also loved all the tea ceramics at the store. Definitely a place to visit again. Here's a storefront that's still under construction. I would say half of the stores weren't really opened yet. This spice store looked like it was pretty much ready to open, but it was still closed and I took this photo behind the wired barrier. 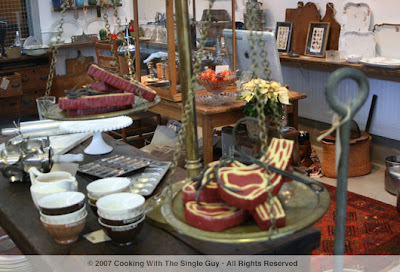 This store is known as Heritage Culinary Artifacts, which has an eclectic collection of things for your kitchen. It really had a pork theme, for some reason. So it's great for all you pig lovers. 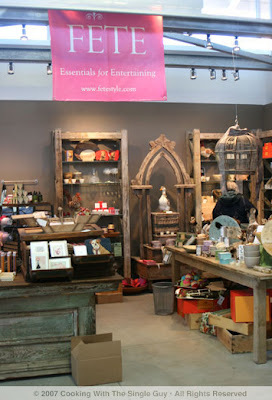 Here's another home furnishing/entertaining-type store known as Fete. There's a weird accent on the first "e" but I can't seem to do it on blogger. Oh well, you know it's fancy when it requires an accent. Not many of the food places were open. 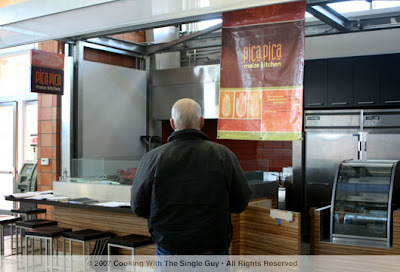 Along with another Taylor's Refresher, there's going to be this Venezuelan place called Pica Pica Maize Kitchen. It should be open soon after the new year. The location will also have a Fatted Calf, a cheese shop and a rotisserie. There'll also be a farmers market in stands outside the building with local farmers selling things in the mornings, but I'm not sure when they'll be ready to do that. Stay tuned. Oxbow Public Market, 610 First St., Napa. 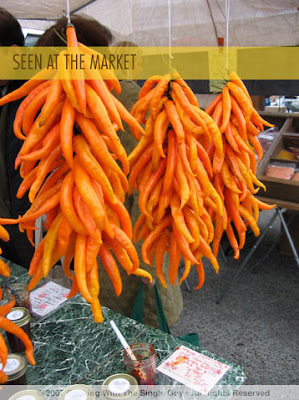 Open daily starting with farmers market at 8 a.m. and restaurants till 8 p.m. Web site. I feel like in my posts lately it may not seem like I've been doing much cooking. But I have. It's just that I've been having a low-key holiday season this year, so when I have been cooking, I've been sticking with my tried-and-true recipes, many of which I've blogged about in the past. Take, for example, Christmas dinner. I spent most of the day at home cooking, making some of my favorite recipes but adding a few changes here and there. I thought I'd give you a look at my Christmas dinner this year, and maybe it might give you an idea for dinner on New Year's Day. Enjoy! 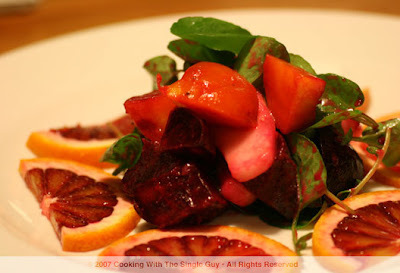 Roasted Beet Salad with Pears and Baby Watercress in a Blood Orange Vinaigrette. I started my dinner with a beet salad because you know I love beets. This salad is very similar to this blood orange and roasted beet salad here, but I switched it up by not using goat cheese and adding fresh Bartlett pears. The pears made the salad more refreshing and juicy. I also got those baby watercress at Whole Foods (they're the ones where the watercress stem is very thin and the bunch is sitting in a tray of water). Meyer Lemon Custard Cakes. 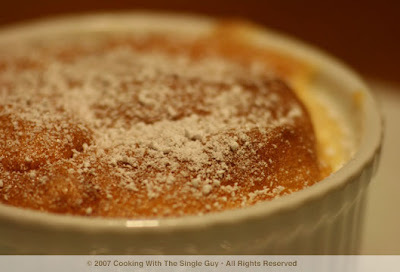 I ended my Christmas dinner with this easy-to-make lemon custard cake. I got the recipe originally from Martha Stewart's Web site. When I made them last year, I enjoyed them so much when made fresh and with Meyer lemons in season. So I did them again for Christmas. So that was my Christmas dinner. (And boy, did I pay for it with the dishes to wash! I think I'm still washing dishes.) I have to say I really liked the beet salad and the lamb chops smeared with butternut squash as I cut into them. So what was your favorite thing about Christmas dinner? I'm very Jewish when it comes to Christmas because you'll typically find me at the movies. As a single guy living away from my family, I often find myself sharing my Christmas with other strangers in a dark room and the flickering light on the projected silver screen. This year, I decided to check out the new Sundance Kabuki Cinemas on Christmas Eve. The Kabuki Cinemas in San Francisco's Japantown recently went through a renovation, now under the ownership of Robert Redford's Sundance Group. Much of the highlight of the changes focuses on the food, including three eating formats for movie goers, created by Chef Vincent Schofield, formerly of Boulevard. Things are so new that they're still old. Many of the signage haven't been changed or updated. When you approach the Sundance Kabuki theaters, you don't really see any major change from the outside, although it seems like they've added more bamboo trees inside and outside of the place. 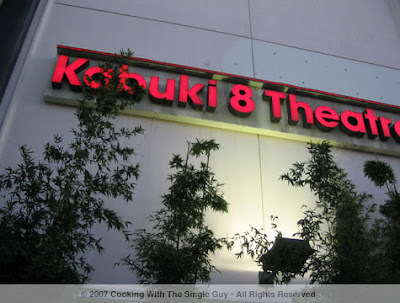 Here you can see that the sign outside still says Kabuki 8 Theaters instead of Sundance Kabuki. One of the major change as far as entertainment is that seats are assigned. You can go online and purchase your ticket and then select your seat. If you don't buy your ticket in advance, then when you go to the ticket office, you see a computer screen with a seating chart and the clerk asks you to select your seat. While all this is cool and personalized, I bet this will really make the lines go slowly as people take their time studying the seating chart to pick their favorite seat. Sales clerk: The $1 amenity charge is so that we promise not to show any commercials before the movie. Chef Ben: But what if I want to see commercials? Will you waive the amenity fee? I so dig those Mac-PC commercials. Can I see those? Chef Ben: Why don't you just add the $1 into the total price instead of separating it out and calling it an "amenity" charge? Chef Ben: Hey, does the amenity fee include a back rub from Robert Redford. That'll be cool. OK, I'm so amazed that I was sold a ticket and was able to sneak all the remaining photos in. I'm pretty sure I'm on someone's list now. This one spot of the theater was really cool and very Sundance-like. 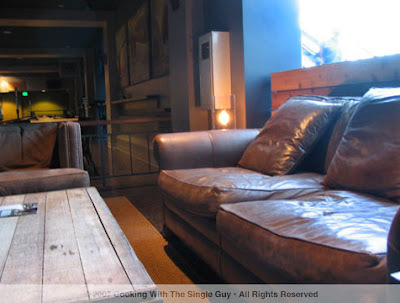 It was a waiting area with this really big comfy leather sofa and club chairs. 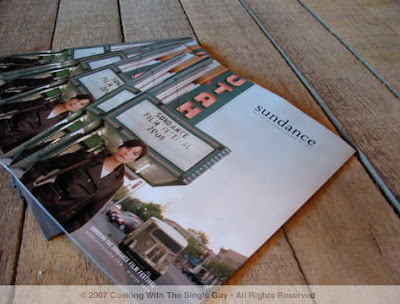 Of course, the Sundance catalog was all over the place. So before my movie, I checked out the Bar Bistro on the second floor where all the theaters are. 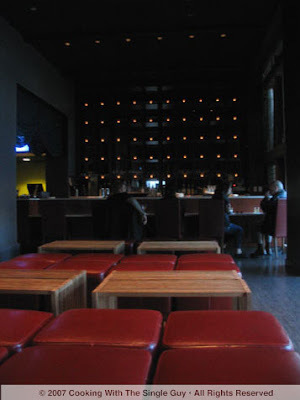 It has a bar that serves alcohol, table seating along the side and these big benches and ottomon-like chairs in the center area. I decided to sit here because the table seating were along the lobby where movie goers walk back and forth watching you eat. This comfy area was a bit more hidden. The Bar Bistro offered a menu with a variety of sandwiches and panini, salads, starters such as Coca Cola pork ribs, 10-inch pizzas and dessert like house-made churros. 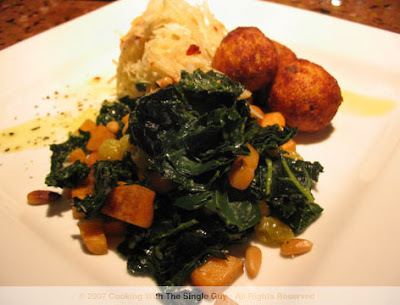 The menu had a mix of Mediterranean/Spanish/California cuisine. 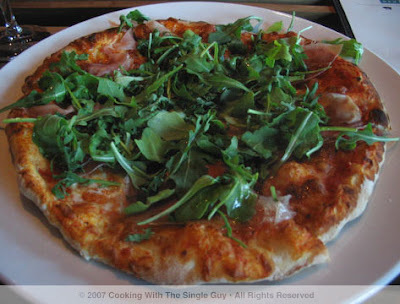 I ended up getting the 10-inch pizza with arugula and prosciutto. 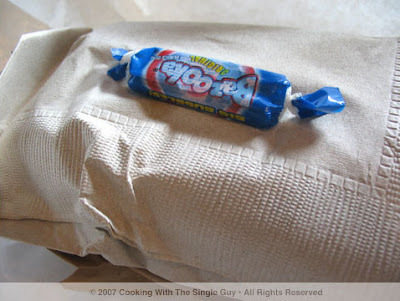 It was a lot for $12 and when I bit into it, I felt like I was sitting at Pizzaiolo or Dopo. The thin-crust pizza tasted like it was made in a wood-fire oven and it really did taste comparable to some of the better pizzas around. I think I was partly surprised because I've never had such a great pizza at a movie theater. The ingredients were fresh, it didn't take long for it to arrive, and it had a very satisfying sauce. I enjoyed it and can't wait to try the other flavors. 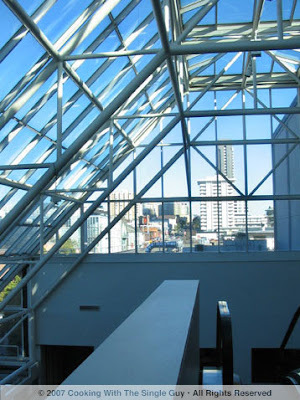 One floor up you'll see the Balcony Bar where you can get drinks before going to your movie. Now that may actually make some movies more bearable to watch! But you have to drink your drink here. It's not allowed inside the theaters, although food is OK to bring in with you. Both the Balcony Bar and the Bar Bistro are open after 4 p.m. on weeknights and for lunch and dinner on weekends. After my movie (I saw Juno--loved it! 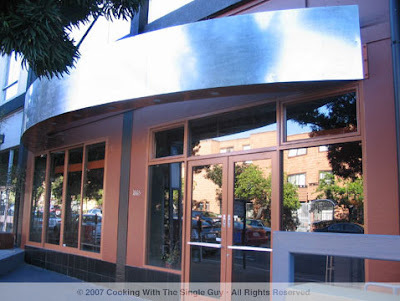 ), I went to check out the adjacent Kabuki Kitchen, in the spot formerly a Pasta Pomodoro. 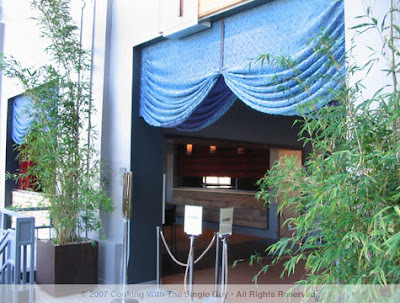 The place is so new that, again, there were no signage outside letting people know it was called Kabuki Kitchen. In fact, a few people walked in thinking it was still Pasta Pomodoro. When you walk in, there's a bar to the right and a lot of tables on the top and lower level. Then an open area where you can look into the kitchen. 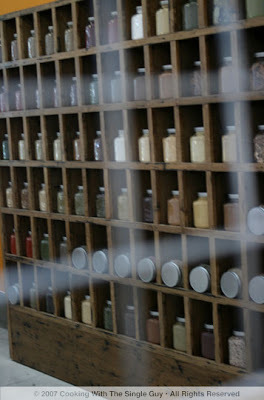 I would show you pictures but the place was decorated like a cave. So it was very dark with just candles for lighting. Luckily there were some ambient light at the bar where I sat. 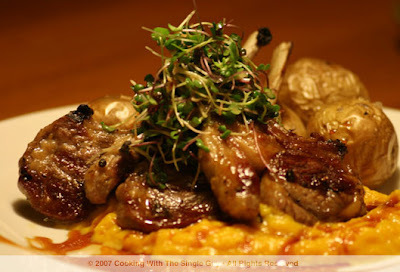 For dinner, Chef Schofield offers similar items like Bar Bistro (such as the Coca-Cola pork ribs) with a few additional items. Since I still had that pizza in me, I ended up trying the Mahi Ahi Poke ($13) as a starter. It was your basic poke, which is the Hawaiian style of ceviche using soy sauce as a marinade. I didn't really enjoy the use of mahi mahi as poke because it didn't have a rich flavor like the ahi (tuna), which is more traditional poke. But it was nice and light. I would have enjoyed it more if it was all ahi instead of mahi ahi. The taro chips on the side were good. For my entree at Kabuki Kitchen, I ordered the Butternut Squash croquettes with celery root and sauteed cavalo nero (that's the greens) with persimmons ($17). It was a very fancy sounding dish. The croquettes were just OK and the celery root was bland. The greens weren't any better. Of all the food I ate at the Kabuki, the pizza was probably the best thing. The service at the Kabuki Kitchen was friendly but seemed a bit frazzled. Probably after a few months, things will be more settled. Sundance Kabuki Cinemas, 1881 Post St. at Fillmore, San Francisco. Web site. Dinner reservations at Kabuki Kitchen, PH: 415.409.6878. Happy holidays to everyone! I hope you're all enjoying this special time of the year with family and friends and, of course, some good food. In the spirit of giving, I thought I'd do something special and create this video below. It's actual a blooper reel of my attempts in making my In The Kitchen demo videos for the blog this past year. As I've mentioned before, I'm a one-man, low-budget production. So when I do these demos, I usually just wing it with no written script or no director. What that usually means is me making several tries at talking and making sense at the same time. Not as easy as you might think. Anywho, hope you enjoy my bloopers! And thanks again for visiting my site. I wouldn't even subject myself to this public humiliation if it weren't for you! Happy holidays! When I want noodles, I want them to be fresh and comforting. 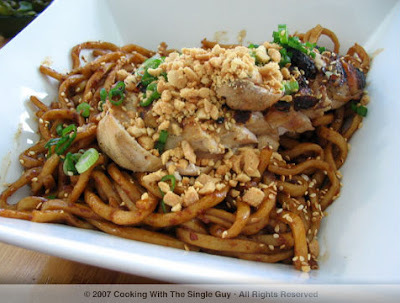 Noodles are the type of food that you want to eat at authentic, hole-in-the-walls. Several bloggers go on and on about noodlesfrom ramen to chow meinwaxing poetic about these slurping goodness. 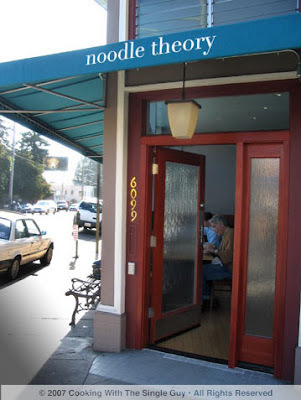 Earlier this year, Noodle Theory opened on the edge of my Rockridge neighborhood in a former Double Rainbow ice cream parlor. Recently, I finally made it for lunch at the A-frame-like tiny noodle bar. Joining me was my friend Vera, who lives nearby and has been to Noodle Theory several times. We got there before noon and didnt have any problems finding a table. The restaurant has all their tiny tables along the glass wall facing Clairemont Avenue. I got the view looking out the window while Vera got the view of the cooking station where all orders are made in flaming woks behind the counter by about three cooks. Unlike fully dedicated noodle bars where you might get 10 varieties of ramen or just as many versions of won ton mein, Noodle Theory is a focused noodle bar with only a few selections on some of the typical favorite noodles: soba, ramen, udon, and crispy noodles. The noodles are all topped by properly sourced California meats, mostly Niman Ranch. 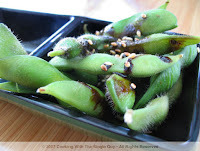 As I perused the menu, our server brought us a small dipping dish filled with edamame, the popular Japanese soy bean bar snack. It looked vibrantly green but doused with a dark sauce that was a combination of soy and balsamic vinegar. That signaled the theme of Noodle Theory: serve up classic Asian dishes and accompaniments but add a westernized twist to them because they can. It was fine, and the dark sauce wasnt as powerful as it looked. For our lunch, we ordered the shrimp dumplings ($8.50) as a starter. 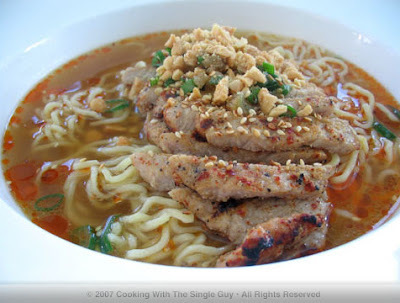 Vera ordered the Spicy Pork Loin Ramen in Peanut Lime Cilantro Broth ($9.50) while I got the Chicken Ginger Noodles ($9). 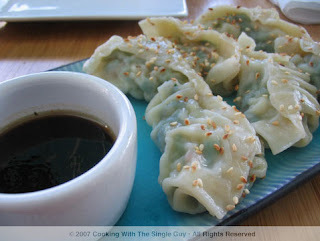 The dumplings arrived soon after and they had a crumpled skin surrounding the exterior. The dumplings were plump and tasty, but nothing spectacular. It was fresh and filling but didnt taste anything better than what you could get at a Chinese restaurant. When our lunch arrived, the server told Vera she should stir the bottom of her broth because the creamy peanut sauce typically settles in the soup bowl and itll blend nicely with her broth. Of course, I distracted Vera by taking a picture of her ramen and then grabbing a taste of her tender pork loin, so she forgot to stir her broth. Without stirring, her broth tasted thin and insignificant. But she said later that after she remembered to stir in the peanut, it tasted full and creamy. My ginger noodle dish was a substantial order. The freshly grilled Fulton Valley chicken topped these very darkly tinted thick noodles. I found it odd that Noodle Theory feels the need to add so much color to their noodles by using what apparently is dark soy. But despite the dark look, it wasnt at all salty. It just looked that way. The chicken meat was perfectly tender and very moist. It felt very healthy and fresh. And while the noodles were dark, they were balanced enough that I felt the overall dish was satisfying. Were the dishes authentic? Definitely not. But I dont think thats what Noodle Theory is all about. Noodle Theory is classing up noodles in an attempt to expand its audience. Is this really necessary? In a sophisticated neighborhood like Berkeley-Oakland where Asian food is everywhere, I dont think so. Maybe in Walnut Creek or Pleasanton, where Zao Noodle (which seems like the model for Noodle Theory) is focusing its expansion in the suburbs while exiting its city locations. For dinner, Noodle Theory has much of its lunch offerings with just a few more entrees. (But Im always a believer that noodles are best for lunch.) And while Noodle Theory is a competent approach to westernized noodles, Id rather head to Chinatown to get some of the real thing. I didnt have time to post this photo earlier, but I figured youre all probably still doing your Christmas shopping so you wont have time to visit the farmers market anyway. So as always, I bring it to you! I snapped this photo of these beautifully brilliant chiles hanging at the Tierra Vegetables stand at the Ferry Plaza Farmers Market in San Francisco last Saturday. The color was so amazing it literally stopped me in my tracks. Tierra always has such unusual chiles for sale that I can always count on its stand for a beautiful shot. I dont think these chiles were for sale, just a way to attract buyers (and it worked). They were hanging over these bottled jars of the Rojo chile jam. While the jams were this beautiful bright red color, it was a bit too hot for me. Even though I like spicy food, it was just a tad too much. But maybe youll like it. You should try out their chile jams next time youre at the Ferry Building on a Saturday. Itll definitely perk you up on a gray morning. Well, there I was this past weekend. On Chestnut Street in the city’s Marina District, where joggers have switched to biking in stretchy pants because of the cold weather and young couples walk around in matching Patagonia vests. 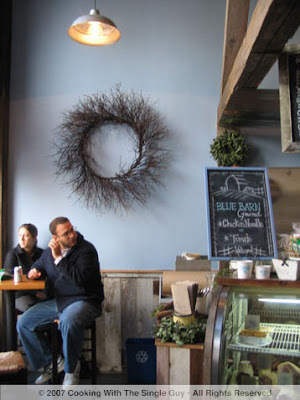 In the spot once selling pizza by the slice from Cybelle’s Pizza, you see this rustic barn façade, now the front for Blue Barn Gourmet--what can best be described as a seasonal sustainable deli. 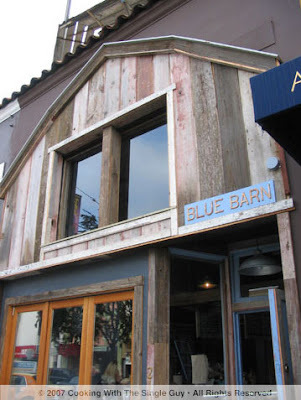 The person behind Blue Barn is Sam Joshi, who already has a couple of Marina properties (Mamacita and Umami). 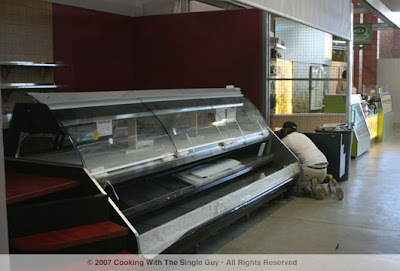 While it calls itself a deli, it seems that much of the business is in the prepared foods section. 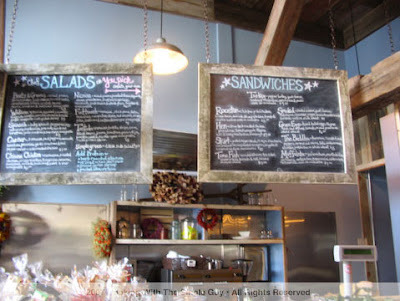 They sell sandwiches and salads made to order using produce from Oak Hill Farm. When you walk in, you definitely get the barn motif. But for me, and probably many others, you feel a bit overwhelmed by the descriptions of the salads and sandwiches available to order. My suggestion is to go up to the register where you can pick up a paper menu. Grab a copy, move off to the side and study it, then go up and order. Regulars who already know what they want will thank you. This is the counter near the register where you order. In the back, you see the cooks working busy in the kitchen making the sandwiches. 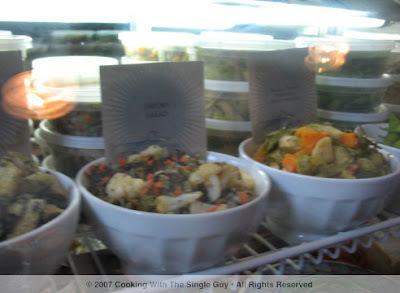 In the front are all the various ingredients for the “You Pick Salad” sold for $7.50. Similar to Pluto’s (which is a few blocks west in the neighborhood), you can create your salad from the variety of seasonal ingredients. There are beets, pomegranates, caramelized onions, roasted butternut squash, marinated seaweed and just as many interesting dressings (think champagne-saffron or sushi ginger vinaigrettes). 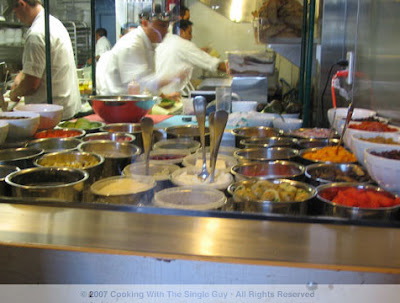 There’s a guy who’s ready to make your salad but he was away when I snapped this shot. 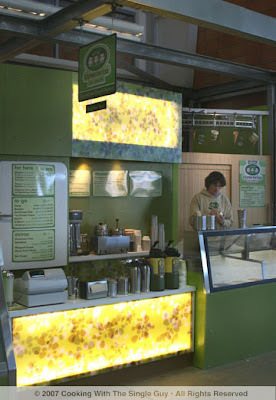 In the counter there are tons of cheese, breads and prepared salads. I just hope they have a lot more in the back, because one person can order that whole bowl and they’d be up a creek! Keeping up with the charcuterie trend, Blue Barn also offers cured meats and fresh artisan bread. Everything looked very fancy, but it must be tough competing with Lucca Delicatessen across the way in the same neighborhood. That’s right, a piece of Bazooka gum. 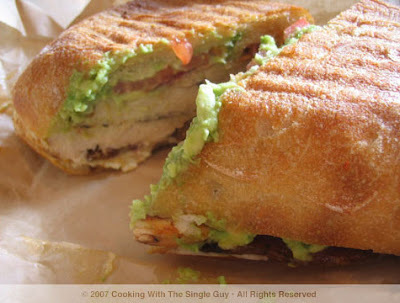 It was such a nice surprise and I thought such a fun touch that I was already in love with my sandwich even before taking a bite. 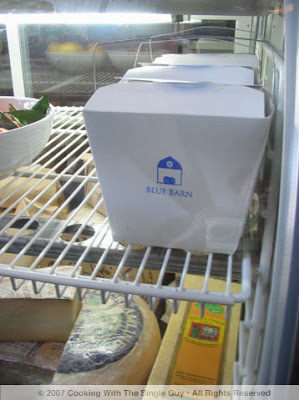 I had very low expectations for Blue Barn Gourmet. I felt the space was too small. It was a bit too overdone with the barn theme. (I mean, how many things can you distress?) And it was in the Marina. But in the end, this is a place serving solid specialty food. Now you have another thing to do in a barn. 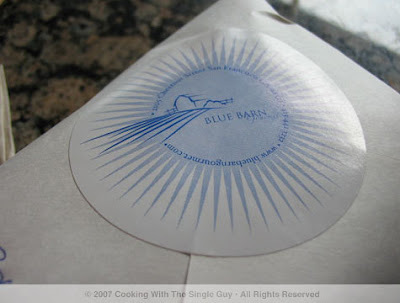 Blue Barn Gourmet, 2105 Chestnut St., San Francisco. 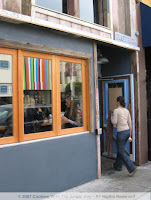 PH: 415.441.3232. http://www.bluebarngourmet.com/ Open daily (except Tuesday) from 11 a.m.
Bring On The Dungeness Crab!